You are here: Home / Health / What is Dermagraphia? Dermatographic urticaria (also known as dermographism, dermagraphia, dermatographism or “skin writing“) is a skin disorder seen in 4–5% of the population and is one of the most common types of urticaria, in which the skin becomes raised and inflamed when stroked, scratched, rubbed, and sometimes even slapped. It is most common in young adults, ages 20-30. 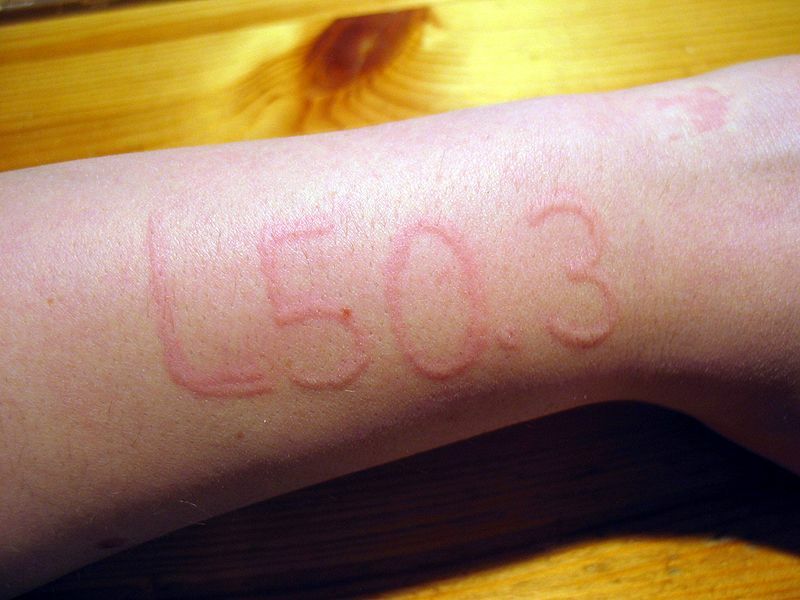 Dermatographic urticaria (“skin writing”). Done by writing the “invisible” letters with an empty ball-point pen and waiting for a couple of minutes. Great article on the psychosomatic aspects of dermagraphia, click here. « Herpes Reactivation From Facial Procedures! Uncommon But It Happens!